"It is my commitment to live a contributive and fulfilling life." Hi! 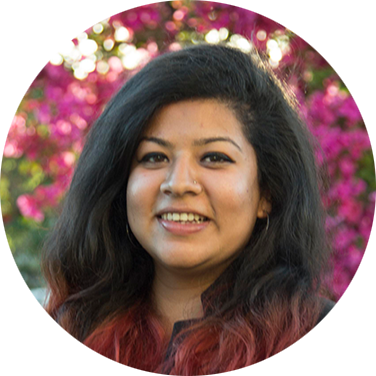 I’m Rhythm Sethi, the Marketing Manager for Productive Learning. I am responsible for everything client facing. I develop and create all of our workshop packets, social media content, newsletters, and web pages. The team calls me the “quintessential millennial,” and I take that as a compliment because it means I am finding innovative ways to connect with our clients in ways that are fresh and relevant. Marketing was not something that I pursued academically. I have a Liberal Arts degree from Soka University and my real passion is dancing. I love telling stories through dance, through moving my body in sync with the music, in cadence with the other dancers and communicating an idea or feeling through our collective effort. I have been a dancer since I was a little girl growing up outside New Delhi, India. I love the way it makes me feel., I get lost in the music and my body takes over and I feel like I am watching it all happen from the inside out. I feel awake and fully alive. Just like all great love affairs, dance and I have had our trials and tribulations. Our love has been tested and my commitment has never wavered. I love to dance and dance taught me about telling stories, connecting to the love inside of me and using that as a way to connect with the world around me. I think that is why marketing came naturally to me. I have a good eye for aesthetics and creating beautiful works of art but more importantly, I love communicating a story that has a purpose and can make a positive impact in the lives of many. I am so driven to make a contribution in the lives of the people around me and I knew when I found Productive Learning it was a perfect fit for me. I have worked on many marketing teams, mostly in corporate settings, and I learned how to craft a beautiful message but at Productive Learning, I feel we can have more of an impact in the world. Our team is a group of people that live their work and love their work and I take great pride in connecting our team with other people that are looking to walk the talk and make a positive contribution to their lives. I had worked in the corporate environment for years when I found Productive Learning. I remember being stunned at my first team meeting. All the corporate manners I had grown accustomed to following were no longer the priority. Authenticity, connection, and understanding are the priority with them and I realized that my job wasn’t to create beauty it was to share the beauty that is inherent in the work we do. That’s when I knew I had found my home. Outside of Productive Learning, my partner Angela and I have four darling, loving fur babies called Kofu, Bella, Kuma, and Taiga. We love to take our dogs, Kofu and Bella, camping but hate cleaning out their fur after. I love trying new things like surfing, yoga and public speaking. I dance as often as I can and I recently signed up for a ballet class. I miss my family in Gurgaon, India and although they tempt me to come back by sending me all of my favorite goodies I know they are very proud of me, the life I live and the woman I have become.